玩樂家 | 1/29/2012 | Be the first to comment! New March的廣告最近可以在電視上看到，廣告也非常活潑可愛有創意，可以看到一群人開March汽車玩躲貓貓，還用抽鑰匙方式決定誰當鬼(警察車)，March廣告歌曲搭配著很淘氣有貓叫聲的配樂，讓筆者我玩樂印象深刻!這麼可愛的廣告配樂歌曲原來就叫做Chaton fripon，這可是首法文歌哦~中譯就是「淘氣貓 」，March廣告配樂上「淘氣貓 」是不是很配呢?現在可以在網路上全曲聆聽與下載哦! 玩樂家 | 1/25/2012 | Google服務與應用 Be the first to comment! 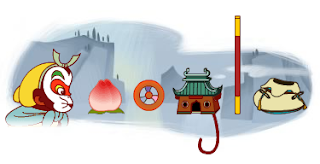 玩樂家 | 1/23/2012 | Google Logo Be the first to comment! 玩樂家 | 1/19/2012 | Be the first to comment! 玩樂家 | 1/14/2012 | Be the first to comment! Doodle-Steno's Law 定義者Nicolas Steno 374歲誕辰! 哇!今天1/11Google Doodle怎麼被剖面呈現地層圖了呢?原來是要紀念Steno's Law定義者丹麥地質學家 Nicolas Steno 374歲誕辰! Nicolas Steno 在地質學方面成就極大，可稱為地質學之父! 玩樂家 | 1/07/2012 | Be the first to comment! 今天1/7是美國漫畫大師、《阿達一族》創作者 查理．亞當斯 ，查理．亞當斯專擅於創造黑色幽默和讓人驚悚的角色，可以從最知名的作品阿達一族看出!從Google 查理．亞當斯 100歲誕辰紀念Doodle就可以看出查理．亞當斯的漫畫風格哦! 玩樂家 | 1/02/2012 | Be the first to comment!